Our 8mm Magnetic Balls have a diameter of 8mm and come in tubes containing 25 individual Neodymium ball-shaped magnets. 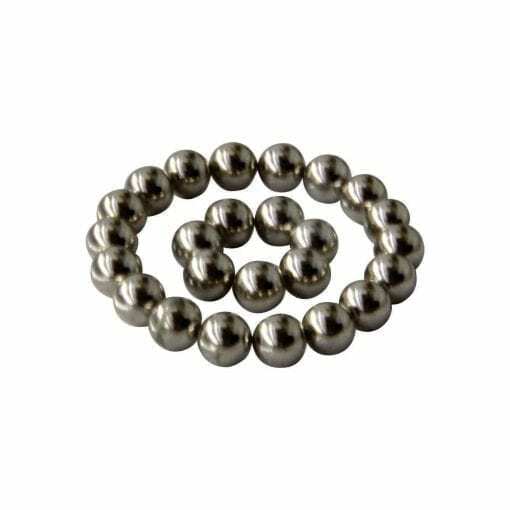 These balls are nickel plated an are axially magnetised. Our Neodymium (Rare Earth) magnets have a very high power to size ratio. You will find that even the smallest Neodymium magnet will surprise you with its strong pull force. Take care while handling these as they will want to join together. If you allow these to join with force, they WILL shatter into small pieces. You will find smaller sized Neodymium magnets are used in a wide range of applications from gate closures, computer sensors, and magnetic hard drive disks. Retail spaces also use these magnets to secure racking and protect product in the form of alarms. With so many uses and due to their high power to size ratio, they are so versatile! Use them around the home, the office or even to hold your tools in the shed!